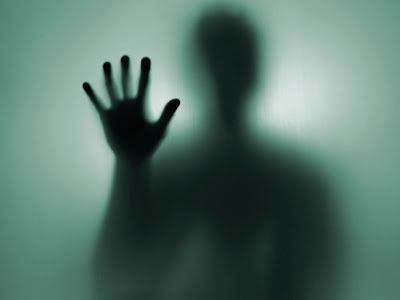 Ghost Hunting Theories: Shadow People: What In the Hell Are They? Shadow People: What In the Hell Are They? Honestly, I don't think the paranormal community does enough about this phenomena. It intrigues me so much that I incorporated into my book on Kindle "Josiah: Undead Cowboy." 1. They can be seen anywhere, new home, old home, haunted, not haunted, park, public building. 2. They are first seen usually out of the corner of one's eye. When the viewer turns his head, he might see it whiz off or he might watch it a few moments before the shadow person perceives being seen and then startles and disappears. 3. They sometimes come with feelings of dread and doom to the viewer that is palpable, not just a fear reaction, but a sense of something bad about to happen. 4. They are often times seen as 3-4 feet tall, human shaped, completely opaque black as if they have mass. Sometimes, they are seen as tall and slender and are sometimes even reported with a top hat. INTERDIMENSIONAL? What if they are interdimensional and are used to being in our space, but when they see that we know they're there, they freak out and leave. It's like they're used to being unseen. Why are we sometimes catching glimpses of them? Perhaps modern day human eyes are changing. There are theories that fast refreshing screens on computers and TVs are making our eyes trained for things they hadn't been before looking at things in a natural world outdoors. DEMONIC/NONCORPOREAL? This one is bantered around a lot. I have a lot of issues with this concept, the main one being, nothing freaking bad happens when they show up. If they don't want to be seen, you'd think a noncorporeal (a being that has never inhabited a human body) or a demon would be sharp enough not to be seen. They'd also manage to get their job done. When they show up, they'd do the dirty deed (whatever that dirty deed demons and noncorporeals are believed to do). These continue to surprise us, especially because there is no particular place or person they show themselves for. It can happen to any of us, at any time. I have encountered adult-sized ones and one short one. The short one showed up during a ghost hunt and lined up with physical things that occurred at the time. It was like a prankster. The adult-sized ones I saw were the classic ones that as I looked up at them, they just disappeared mid step. The ones in my childhood home, seemed to follow the same path each time. All we know that these things have in common is that they can appear to anyone, anywhere, not particularly haunted locations, and they bring with them often a feeling of doom or dread and when they realize they are being seen, they rush away. So, it would seem that we are being watched by something that does not like for us to know they are watching. And that makes me even more curious about them.